Math MATTERS Presentation February 23, 2010 Tina Tipton Student Engagement. 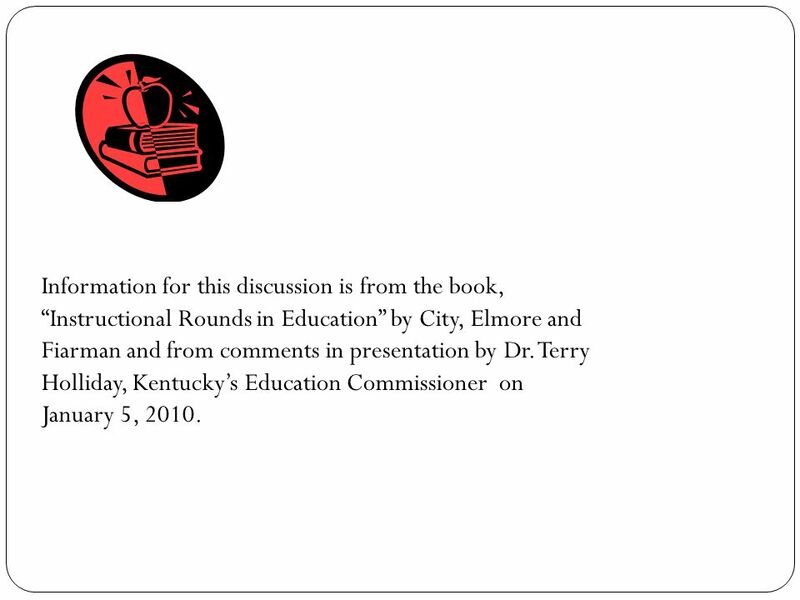 2 Information for this discussion is from the book, “Instructional Rounds in Education” by City, Elmore and Fiarman and from comments in presentation by Dr. Terry Holliday, Kentucky’s Education Commissioner on January 5, 2010. 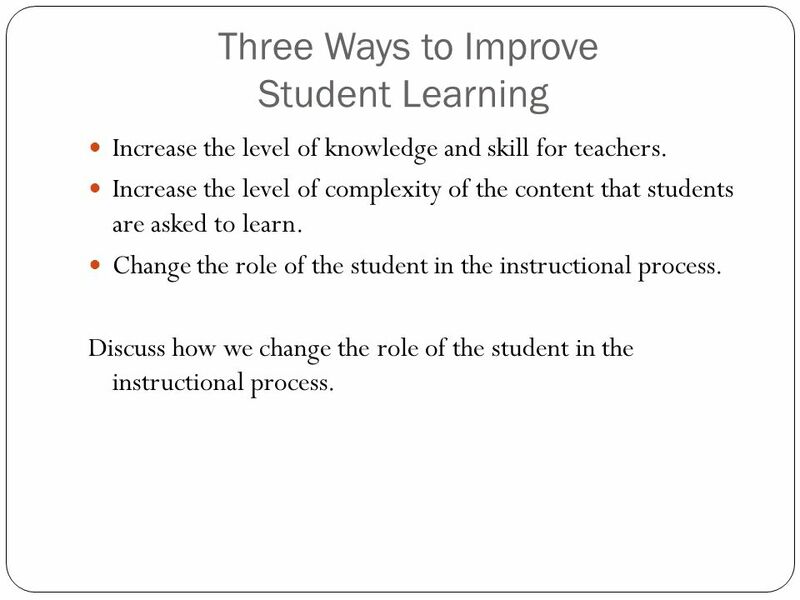 3 Three Ways to Improve Student Learning Increase the level of knowledge and skill for teachers. Increase the level of complexity of the content that students are asked to learn. Change the role of the student in the instructional process. Discuss how we change the role of the student in the instructional process. 4 Observing in Classrooms-Quality Teaching Teaching causes Learning!!! How do you know when students are learning and are performing at high levels? 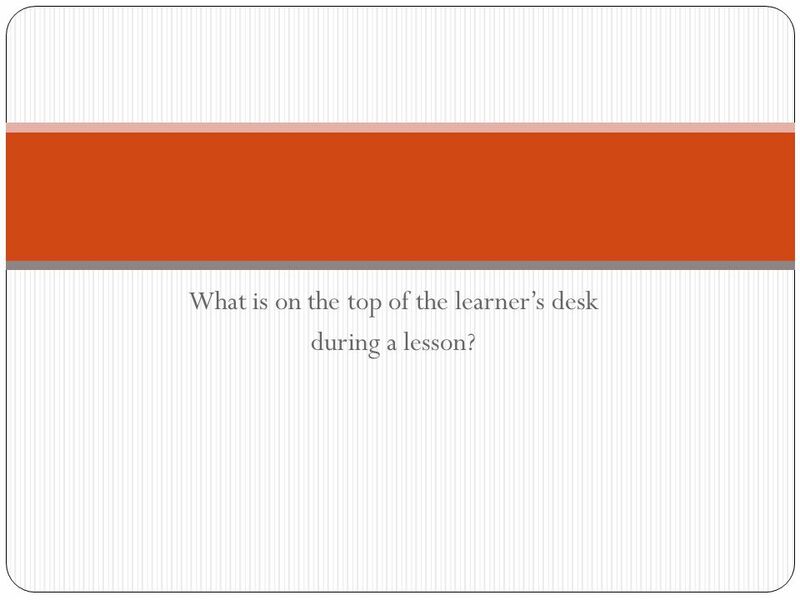 5 What is on the top of the learner’s desk during a lesson? 6 Predicting Student Performance How can I as an observer predict student performance in a classroom? Is it by what the teachers are doing? Is it by what the students/learners are actually doing? 7 The top of the desks!! 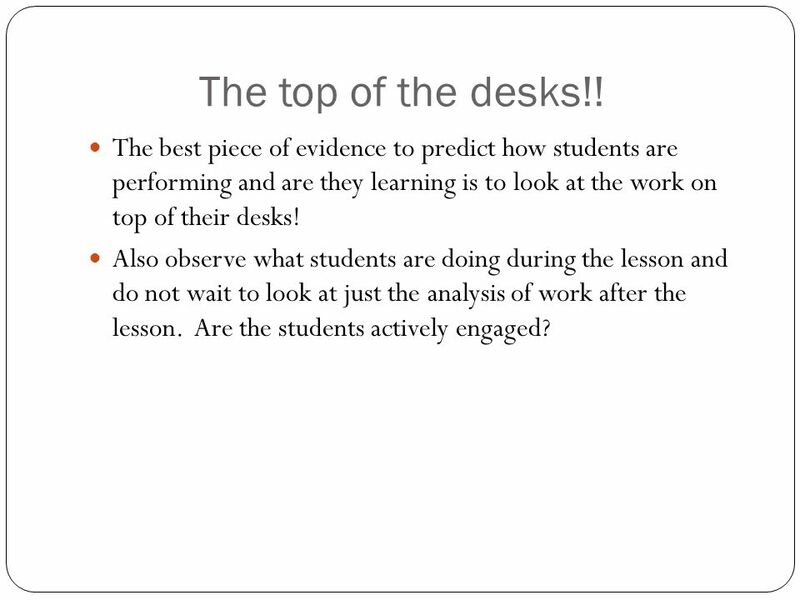 The best piece of evidence to predict how students are performing and are they learning is to look at the work on top of their desks! Also observe what students are doing during the lesson and do not wait to look at just the analysis of work after the lesson. Are the students actively engaged? 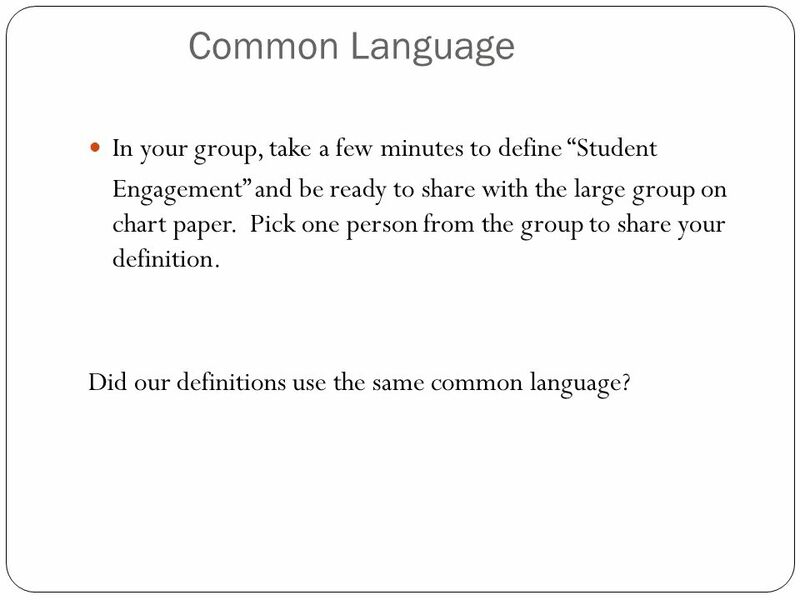 8 Common Language In your group, take a few minutes to define “Student Engagement” and be ready to share with the large group on chart paper. Pick one person from the group to share your definition. Did our definitions use the same common language? 9 Interventions and Student Engagement Regardless of the strategies or activities, we must get our students effectively engaged in learning and performing in the classroom. 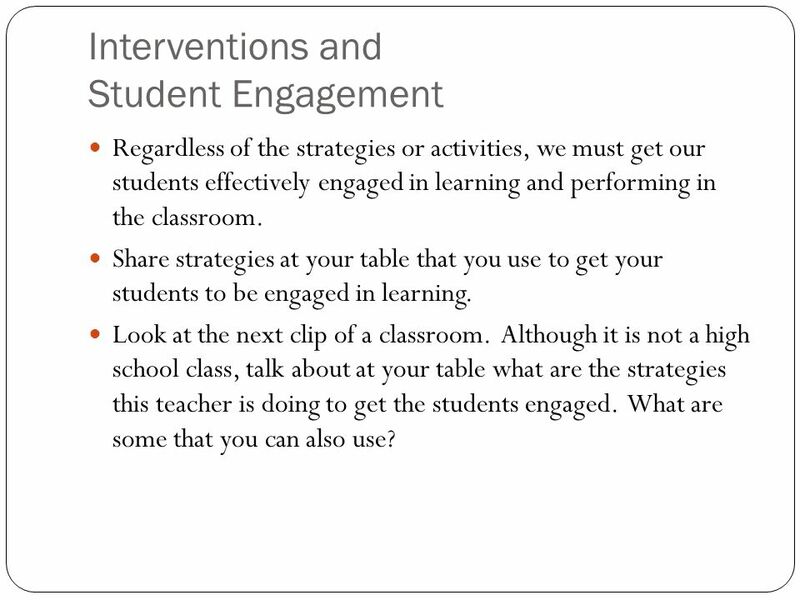 Share strategies at your table that you use to get your students to be engaged in learning. Look at the next clip of a classroom. Although it is not a high school class, talk about at your table what are the strategies this teacher is doing to get the students engaged. What are some that you can also use? 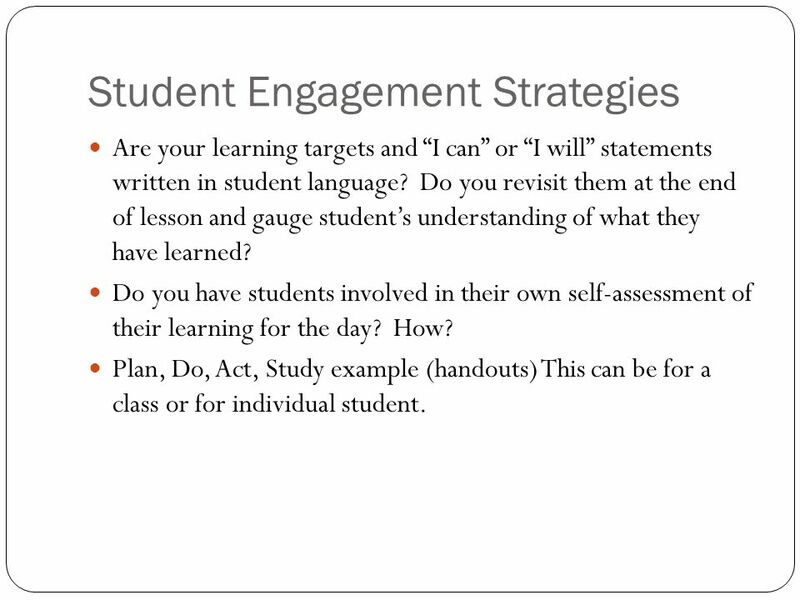 10 Student Engagement Strategies Are your learning targets and “I can” or “I will” statements written in student language? Do you revisit them at the end of lesson and gauge student’s understanding of what they have learned? Do you have students involved in their own self-assessment of their learning for the day? How? Plan, Do, Act, Study example (handouts) This can be for a class or for individual student. 11 Passion for Learning All Children come to school with a yearning for learning. Our aim should be to increase the positives and decrease the negatives so all children keep their yearning for learning. (Edward Deming) One way to help students keep that “yearning for learning” is to have them actively engaged in learning, this means all kids. High performing teachers build high performing classrooms where students are successful. 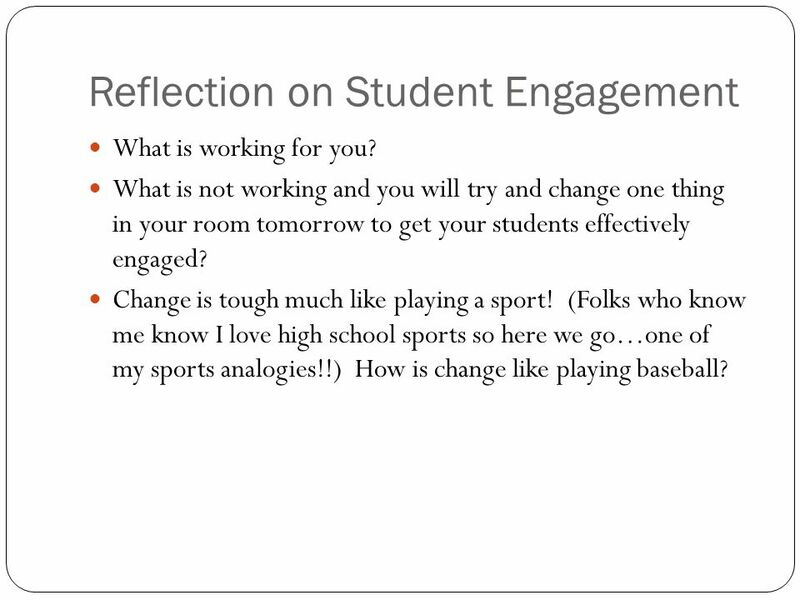 12 Reflection on Student Engagement What is working for you? What is not working and you will try and change one thing in your room tomorrow to get your students effectively engaged? Change is tough much like playing a sport! (Folks who know me know I love high school sports so here we go…one of my sports analogies!!) How is change like playing baseball? 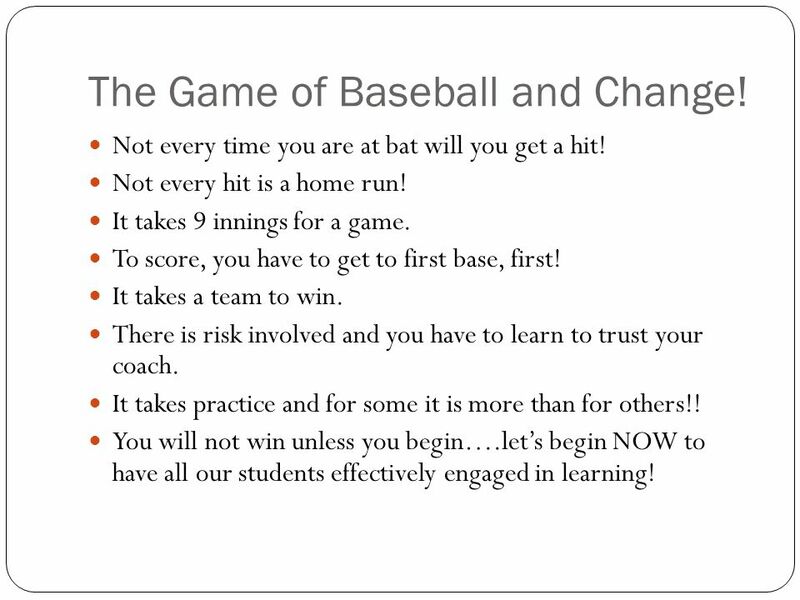 13 The Game of Baseball and Change! Not every time you are at bat will you get a hit! Not every hit is a home run! It takes 9 innings for a game. To score, you have to get to first base, first! It takes a team to win. There is risk involved and you have to learn to trust your coach. It takes practice and for some it is more than for others!! You will not win unless you begin….let’s begin NOW to have all our students effectively engaged in learning! 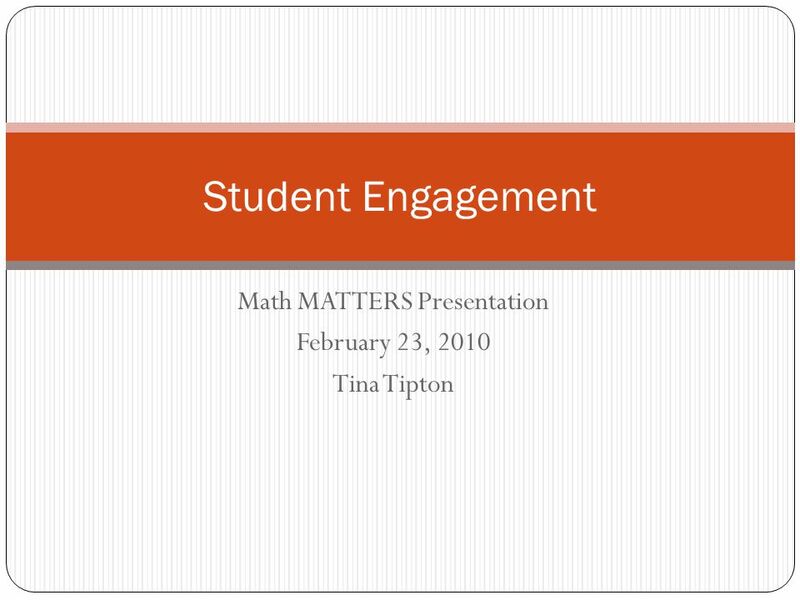 Download ppt "Math MATTERS Presentation February 23, 2010 Tina Tipton Student Engagement." “ A World Class System of Schools ” INSTRUCTIONAL ROUNDS DEBRIEF Insert School Date Adapted from the book INSTRUCTIONAL ROUNDS IN EDUCATION: A Network. Day 2: Learning and Teaching Session 2: Recording Evidence NYSED Principal Evaluation Training Program. November 21, 2013 Presented by: Mike Moreno  Waverly MS Nate Stevenson  Ingham ISD Ingham ISD Leadership Academy PLCs 1. Prepared Especially for the Professional Learning Community of the MONTANA EDUCATORS’ INSTITUTE by Dan Mulligan, Ed. D. June 2010. ACT Close and Critical Reading Using ACT Content Passages Macomb Intermediate School District September 15 th, 2010. Whole site approach to improvement Leading the Learning Workshop 3 - for leadership teams in secondary sites Quality, Improvement & Effectiveness Unit. M-STEP 2015 Principal’s & PD Facilitator’s Meeting January 8 & 13, 2015. “Charting the Course Together” Implementing the Common Core State Standards -Mathematics- Middle School Leadership Teams February 6, 2014.